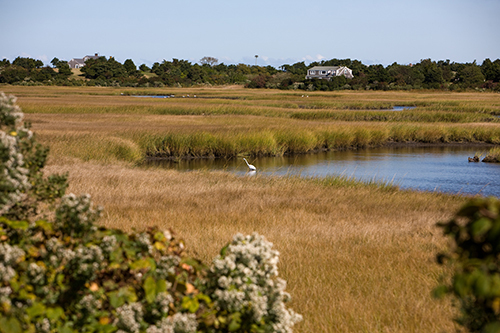 Cobblestone-lined Nantucket may find itself at the forefront of ecological engineering. Kevin Esvelt, Ph.D., of the Sculpting Evolution Group at MIT, is proposing a radical approach to tick-borne illness that is not one of deer reduction but that of recombinant DNA. Dr. Esvelt is credited with developing several key technologies that utilize the CRISPR/Cas9 tool for genome editing in collaboration with George Church’s laboratory. Included in that is the powerful and precise RNA-guided CRISPR gene drive. Gene drives have long been known in nature to override traditional rules of inheritance. Synthetic gene drives harness CRISPR/Cas9, a disruptive technology for genome editing, and for the first time provide scientists with a tool that can influence traits of entire populations. For now this is taking place in the lab, but applications, potentially on wild populations, are far reaching. And controversial. But that is not what is being proposed on Nantucket. “We are trying to pioneer a community-driven, grassroots, local approach that does not need a drive system,” Dr. Esvelt says. His plan is to prevent tick-born disease, Lyme in particular, by breaking the transmission cycle. The Northeast claims the majority of Lyme cases in the country. Nantucket Island, with its favorable tick habitat, has reported a rate as high as 44% of households being affected by Lyme. Dr. Esvelt’s plan focuses on the white-footed mouse, a well known and efficient reservoir host of Lyme. His plan uses both modern and traditional biological tools such as vaccines to engineer Lyme-resistant mice in the native population. Genes encoding antibodies from the most resistant mice would be identified, sequenced and combined in Dr. Esvelt’s lab. Using CRISPR technology, they would incorporate these beneficial genes creating a population of highly resistant mice. “It would be a recombinant mouse, that is, it would not be something that would arise in nature. But it would be 100% mouse DNA,” he explained to the panel on Nantucket. These mice would then be introduced to the native population and spread immunity across generations. The years-long plan would include testing, field trials on uninhabited islands, independent assessment, outside funding and multiple, community-driven checkpoints. “We don’t know how long it will take, but we are confident it will work,” says Dr. Esvelt on the science behind this plan. Islands have the unique advantage of geographical containment, reducing the challenge of dilution from outside populations. Because, overtime, the odds are in favor of natural selection to weed out these new traits. “You do not beat evolution on the evolutionary time scale. Ultimately natural selection wins out given long enough,” he adds. If this plan gains traction, and results, it could lead to similar proposals on the mainland. That will present new challenges and call for the use of more advanced genetic tools that could include foreign DNA or gene drives. Gene drives have enormous potential to address challenges in public health and important agricultural and conservation issues says The National Academy of Science (NAS) in a recently released report, “Gene Drives On the Horizon.” They work best in fast-reproducing species. That’s why they bring a great deal of hope to eradicating insect-born infectious diseases like malaria. But the technology is so new and so far reaching that it is also raising red flags. Lockstep with this potentially sweeping power to alter the target species is the unintended consequences on its ecosystem. Our ecosystem. Bioethicist and a Fellow at Harvard Medical School, Jeantine Lunshof, Ph.D., voiced these concerns in an article for Nature. Some gene drives, such as global gene drives, have the potential to reach the entire world population of a target species. Dr. Lunshof calls for an urgent review of biosafety and biosecurity protocols for experiments using CRISPR and gene-drive techniques in wild organisms. “Unless properly regulated and contained, this research has the potential to rapidly alter ecosystems in irreversible and damaging ways,” she points out. The NAS report also calls for “more research and robust assessment.” But they don’t go far enough, according to Dr. Esvelt. The stakes are so high and the ability for a contained field test of a global gene drive is unfeasible. “All it takes is one,” he says of the room for error. His group is also researching local drive systems with built in safety measures and self-limiting components. And they are also developing nematodes as a model system for predicting how drive systems may evolve or change. For the Nantucket proposal, which does not employ a gene drive, there has been a positive response. Roberto Santamaria, Nantucket’s health director, is intrigued. “We are very impressed by Dr. Esvelt and we are hoping to hear more and see this project move forward,” Santamaria says. Dr. Esvelt will be meeting with health officials on Martha’s Vineyard in July and will continue his dialogue with the residents and experts on Nantucket.